Eating good food offering the best nutritional value eventually filters onto everyone’s menu, as doing so plays a vital role in generating a strong and healthier body and mind. You become what you eat. We are what we eat becomes true and activated once you begin to consciously feed you body with best purest beneficial foods while avoiding empty sugar based caloric energy. Consuming anything that’s manufactured sweet, doesn’t help your body whatsoever, offers nothing to work with or build off, and the end result is you feeling sluggish and tired. So it’s recommended that you begin taking an active role in nourishing your body with the healthiest of foods, which are loaded with nutrients such as, the essential vitamins, fiber, whole grains, and healthy fats such as omega-3. What you’ll begin to experience is a noticeable difference in how you look and feel, this especially once you make these nutritional foods as a routine dietary habit. At any given time, we’ll find ourselves at a crossroads, we realize that we should be eating better, but there are too many tempting and easy options to choose from. There are the convenient fast foods which offer “bad” but delicious tastes, which we cave into easily, while we being aware that they are unhealthy and contributes to our obesity. Even if we do decide to eat healthier at restaurants, and choose to have the broiled fish platter, it’s usually offset because of the additional calories which are ingested by eating the bread, having a soda, and dessert. It’s a difficult proposition to stay away from fast food. Especially the inferior quality which are found in the malls and the majority of restaurants. So it becomes increasingly difficult to restrict what you eat. When eating out, try limiting yourself from the convenient delicious bread, and try not to polish everything off your plate. Instead, ask for a “doggie bag,” and then have the rest of the meal the next day. The best option is making the majority of your meals at home yourself, where you can control the ingredients that’s going into the food. When deciding to make your own meals, you can dictate exactly which items you add, knowing that you’re adding just the freshest or the most nutritious, and not the ones which will deteriorate your health. For instance, as a guideline, the following is what should be considered as a completely balanced and healthy meal which has all the right ingredients for a nutritious meal. • Fresh Baby Spinach – This dark green leafy veggie is considered as one of the best. It’s packed with phytonutrients, fiber, and vitamins, while containing healthy calories. • Wild Alaskan or Atlantic Pink Salmon – Preferably fresh. Most are able to acquire a taste for cooked salmon, as it’s flavor is relatively neutral. Fresh salmon in particular is recommended since this food is a complete powerhouse when it comes to Omega-3, protein, and other good fats, while being low in carbohydrates and calories. Look for the salmon which is “wild,” this since it’s known that farmed salmon can potentially contain more traces of mercury. Wild Alaskan or Atlantic Salmon are also relatively reasonable in cost when in season. The omega-3 that’s found in salmon is found to be beneficial when it comes to natural weight loss, improves the cardiovascular system, while promoting better brain function. • Extra Virgin Olive Oil – Is found to be the premium oil when it comes to the “good” fats that your body needs. One caution when selecting olive oil is to make sure that it’s 100% pure and authentic, so preferably extra virgin. Know that some brands are now combining olive oil with other refined oils, while still labeling them as pure olive oil, so beware and know the source. • Balsamic Vinegar – What balsamic vinegar does is it controls the blood sugar levels in your body, which is vital for your overall health. It’s tangy and zesty taste offers any meal a bit of zip in flavor. • Brown Rice – Natural whole grains such as brown rice are full of vitamins and fiber. So it’s recommended you choose brown rice over the empty calorie white rice variety, which are completely stripped of any nutrients. To prepare this ideal role model meal is easy. Begin by laying out the fresh spinach out on a platter, using all or as little as you want, and then drizzle 1 to 2 teaspoons of extra virgin olive oil and the balsamic vinegar directly over the spinach. Allow this to settle for 10 minutes, as doing so gives the spinach a chance to soak in the oil and vinegar. Meanwhile, cook the brown rice and then begin preparing the salmon. 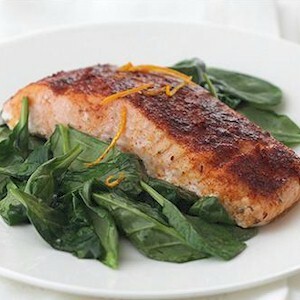 Steam, broil, or oven bake the salmon until it’s just done, and then simply lay the salmon directly over the spinach, while placing the brown rice on either the side. Use fresh lemon to activate taste in the salmon. Preparing a meal of this type shouldn’t take any longer than 15 to 30 minutes. Know that each and every bite will completely nourish your body with the essentials. Once you begin eating better while getting accustomed to becoming healthier, you’ll then find yourself experimenting with all types of similar meals which are loaded with nutrition.